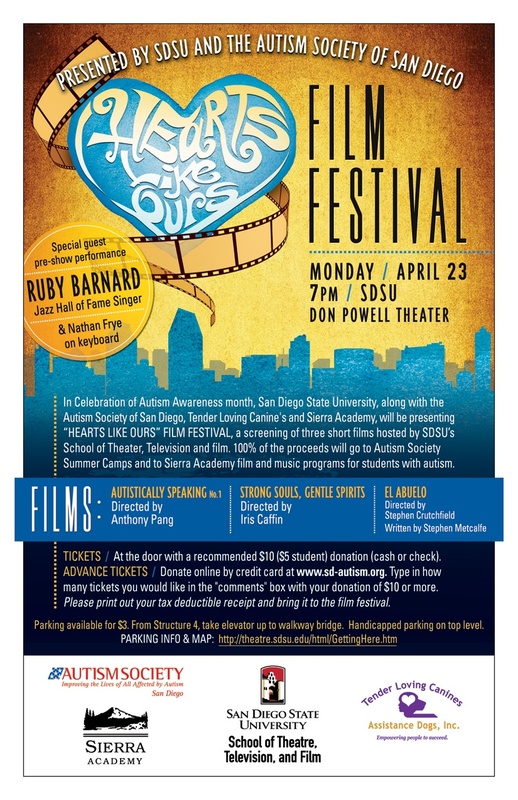 In Celebration of Autism Awareness month, San Diego State University, along with the Autism Society of San Diego, Tender Loving Canine’s and Sierra Academy, will be presenting “HEARTS LIKE OURS” FILM FESTIVAL, a screening of three short films hosted by SDSU’s School of Theater, Television and film. The proceeds of this event will go to Autism Society Summer Camps and to Sierra Academy film and music programs for students with autism. “HEARTS LIKE OURS” will screen these shorts on Monday, April 23rd, 7:00 PM at Don Powell Theater, San Diego State University. The festival will showcase three short films about autism, all made by emerging SDSU student filmmakers. From a heart-felt drama about a boy with autism who finds his voice, to a documentary about training dogs, and an experimental short film created for the autistic mind, this series of shorts is intended to raise awareness about autism. This event will also bring attention to and celebrate local talent who create compelling work on shoe-string budgets that promote social activism and help change the way people see the world. Tickets can be acquired at the door with a recommended $10 ($5 student) donation by cash or check. You can also donate online in advance by credit card at www.sd-autism.org. Simply type in how many tickets you would like in the “comments” box with your donation of $10 or more. Print out your tax deductible receipt and bring it to the film festival. Your donation gets you an evening to see autism from three perspectives, while 100% of your gift goes directly to summer camp and film/music programs for children with autism living here in our San Diego community. A film designed for the entertainment of an audience with autism. Autistically Speaking is a film/research project that begun in 2009 as a serious attempt to create a film for an autistic audience. Combining scientific research from fields like neurology and psychology, accounts from educators and caretakers, direct observations in a natural environment, as well as the concepts and theories of experimental film, Autistically Speaking addresses the individual with autism not as subject but as spectator. The project explores perception and perspective in an autistic world and explores how these individuals see and engage with the physical world, then extrapolating the observations into a film that acknowledges that way of seeing and engaging. The hope is that a model can be created to develop media/film specific to this demographic. A wonderful story of overcoming obstacles and the human-animal bond/relationship. A wonderful story of overcoming obstacles and the human-animal bond/relationship is told in STRONG SOULS, GENTLE SPIRITS. The documentary tells the story of 8-year-old Jolena. After Jolena is born, her mother, Rebecca Cook, notices delays in her development. The road to have Jolena correctly diagnosed is a huge struggle for Rebecca. After several years, Jolena is finally diagnosed with autism. Despite the diagnosis and therapy, life is still difficult and meltdowns still occur. When an autism service dog is placed with Jolena, her life and that of her family turns around completely. A short narrative film about Nick, an autistic boy who doesn’t speak. It is only when Nick is befriended by an illegal Mexican laborer, El Abuelo, that he finds his voice. The short film EL ABUELO brings the storytelling of writer Stephen Metcalfe (JACKNIFE, BEAUTIFUL JOE, studio writer for PRETTY WOMAN, MR. HOLLAND’S OPUS), to the screen once again in a tale about the mystery of human connection. The narrative follows Nick, a young autistic boy, as he surveys the world in silence, eventually finding an unlikely friend in El Abuelo, an elderly Mexican migrant worker. Through the bond formed in their relationship, Nick’s silence is broken. Stephen Metcalfe wrote EL ABUELO from a personal perspective; his teenage son is autistic. Metcalfe teamed up with Director Stephen Crutchfield (an SDSU graduate student) and Producer Patrick Scott of Drama House Productions to make the film. The film stars 2005 Independent Spirit Award nominee (Best Debut Performance in ROBBING PETER) Louis Olivos, Jr. as El Abuelo, and young San Diego theatre actor Jonah Gercke in his debut film performance as Nick. As our society struggles to welcome those on the autism spectrum, and secure our borders without betraying our humanity, the filmmakers hope that Nick and El Abuelo’s relationship provides a glimpse into what can happen when we diminish our differences, and celebrate our common ground. Films will be followed by a Q and A with the filmmakers and Autism representatives. SDSU is located on the East Side of San Diego just off the 8 Freeway, at the College Avenue exit. At the end of the exit turn right to reach the campus. Follow College Avenue two stop lights to Montezuma and turn right. Take Montezuma two stoplights to 55th Street where you turn right. At the first stop light; turn left into parking Structure Number 5. In this structure you may purchase visitor parking passes for 2-4 hours depending on the event you are attending. Handicapped parking is located in the Cox Arena parking Area called K lot, located to the right one more stop light ahead on 55th Street. To get to the Performing Arts Plaza enter the San Diego State University campus on 55th Street and walk directly toward the Cox Arena and turn left just past it. Follow this path uphill and eventually curving to the right. On this walkway the Don Powell Theatre and the Performing Arts Box Office is the second building on your left. • Structure 4 take the elevator up to the walkway bridge. Handicapped parking is on the top level. • Parking Lot M, Lot Q and Lot R Visitor Parking Permits are available in these lots and will allow visitors to park on any space.